Is Ed Sheeran not-so-secretly married? In a new interview, the “Shape of You” singer hinted that he and fiancée Cherry Seaborn may have tied the knot in private sometime in the past few months. Speaking to Access about his upcoming Apple Music documentary Songwriter, Sheeran shrugged and gestured to a band on his left ring finger in response to a question about wedding plans. “How did you manage that?” the interviewer asked, to which a blushing Sheeran replied, “Well, I never really do anything too public anyway,” and accepted congratulations. 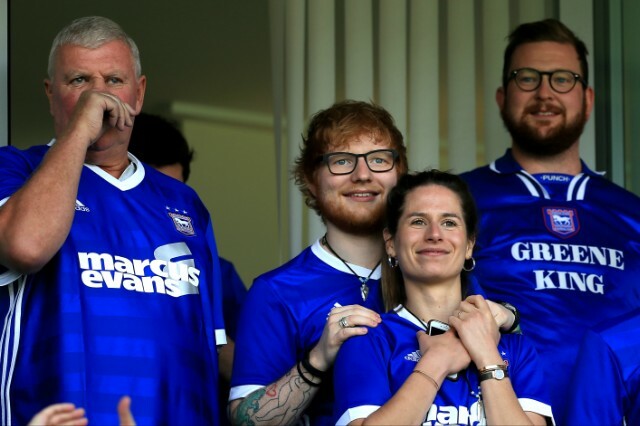 It’s not the first time Sheeran has appeared in public sporting a possible wedding ring. He was first seen with a silver ring in February, but later told reporters he wasn’t married yet, just wearing an engagement ring. (“I never saw why men didn’t wear engagement rings. It’s the same commitment either way,” he said at the time.) The new non-denial isn’t exactly a confirmation, but it is a notable shift. Perhaps the couple decided to seal the deal privately after a local planning council blocked Sheeran’s plans for a faux-historic backyard chapel last month. Sheeran and Seaborn first announced their engagement in January. They wouldn’t be the first celebrity couple to pull off a secret wedding recently—Cardi B and Offset and Phil Elverum and Michelle Williams similarly decided to keep the news to themselves, at least for a little while. Congratulations, maybe! Watch Ed Sheeran respond to wedding questions below.